BLT Risotto, in the fab VersaGlass Ziploc containers we got at #AWBU. Another thing I learned: How to make these pretty collages and put them on Pinterest! Yes, more risotto. I’m kinda addicted. 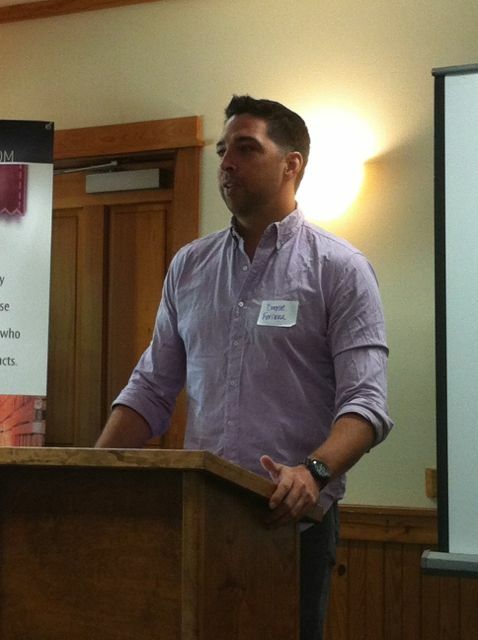 I just got back yesterday from a whirlwind weekend at Arkansas Women Bloggers Unplugged. After sleeping for like 20 hours, I regained strength today with about a dozen cups of coffee and a healthy load of carbs. The flow of awesome home-grown produce continues from my husband’s co-workers, with another (probably last-of-the-season) recent delivery of beautiful baby tomatoes. I mention this to explain why two risotto photos in a row have them. I don’t even care if it’s redundant, because they’re so darn delicious this way. Inspired by a video I watched today by the luscious (at least, during his Top Chef days) Fabio Viviani, I decided it was a good day to make risotto again. I already had the rice and broth, and even some decent parmesan and a lemon. And I do NOT plan on going to the grocery store this week. What I didn’t have was pancetta, which Fabio used in his version. I did, however, have a crap-ton of bacon in the freezer, a remnant of the last time I let the husband buy groceries on his own. After the fresh basil went in my version, I remembered the tomatoes. There was already bacon. The fresh basil kinda represented lettuce. 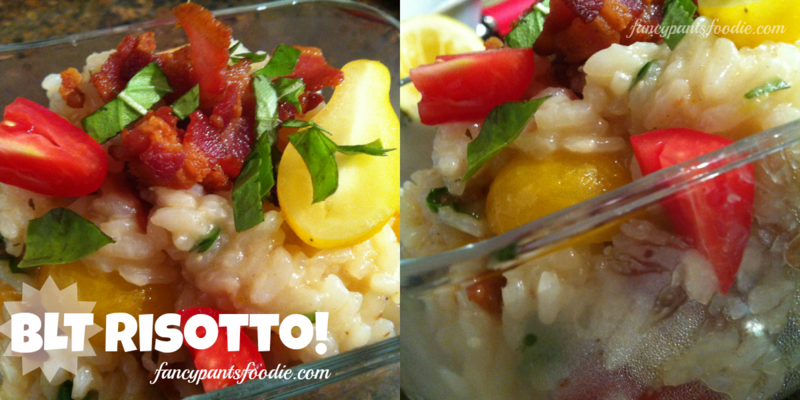 Clever recipe nirvana: BLT Risotto! Over the next few days, I’ll tell you more about what went down at #AWBU, especially the stuff from Foodie Friday. We did an Iron Chef competition with herbs. It was awesome. Our team won “Best Use of Herbs.” Recipe later. For now, carb up with me and recover from whatever mayhem you encountered this weekend! Cut the bacon into narrow strips. Heat up a large sauté pan and add the bacon. Add the olive oil to help the bacon brown without burning or sticking (at least, not terribly bad). Cook the bacon until crispy, giving it a little stir every so often. Remove the bacon, leaving the grease behind. I used the slotted spoon from an old Fry Daddy. Carefully pour off all but about 4 T. of the grease. Over medium-high heat, place the rice into the grease, then stir to coat. Toast the rice in the pan for a couple minutes, then start adding the broth, a ladle or two at a time. (Honestly, this time I just poured it right from a can. I usually make my own and have it hot on the stove while making risotto. Here’s proof it works the lazy way.) Add the juice from your lemon here, but I suggest you zest it first and hang on to the zest for later. Stir constantly, making sure the rice doesn’t stick to the bottom. Don’t answer the phone, rescue kids from disasters or otherwise remove your attention. It will burn. And if you turn off the heat, the outside will turn mushy before the inside is cooked. You’ve been warned. When the rice is pretty dry, add another ladle or two of broth. Stir. Repeat. When the rice starts to look soft and pillowy, start tasting it to see if it’s done. Some folks like it “al dente” like pasta (still a little firm). I like it super soft. Your call. When the rice is maybe halfway done, stir in the seasoning blend and/or chili flakes, if you’re using them. I don’t use dry herbs very much anymore, but I am currently hooked on a mix my mother-in-law gave me. It’s a combination of dried tomatoes, red bell pepper and other veggies, as well as thyme, basil, oregano and chili flakes. When the rice is done to your liking, turn off the heat and fold in the cheese. Be sure to work it in so you don’t have clumps. Now, chiffonade (roll up and cut into ribbons) the basil leaves. Fold in most of them, leaving a few for garnish. Stir in the bacon, again leaving a bit for garnish. And at the very end, so the heat doesn’t turn them to mush, fold in the tomatoes…you guessed it…saving a few for garnish. P.S. Here’s an old post with some basics on how to make risotto, from the day we made it in culinary school. P.P.S. I’m still offering cooking classes in your home or other meeting place, and I start with risotto. Interested? Let me know below. P.P.P.S. 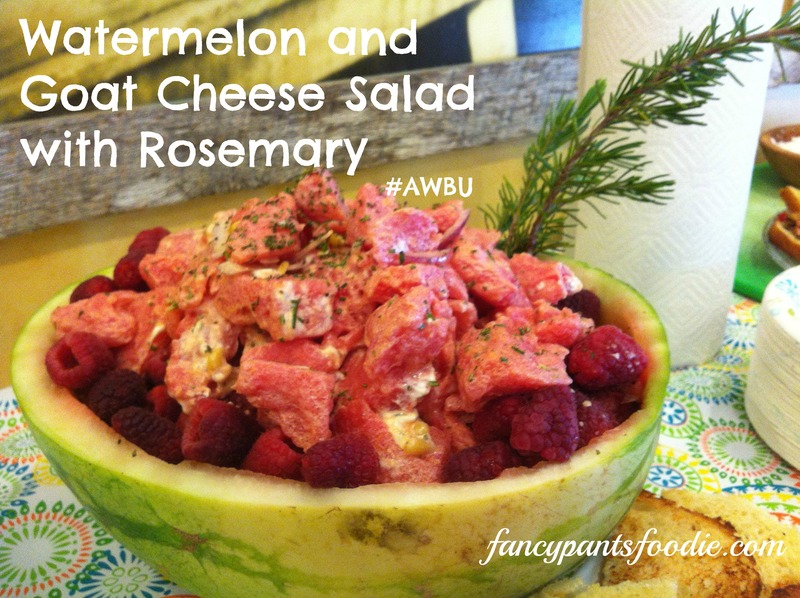 AWBU ladies, what food did you crave/make/etc. when you got home?